The Mediterranean Diet Pyramid is based on the dietary traditions of Crete, Greece, and southern Italy circa 1960 at a time when the rates of chronic disease among populations there were among the lowest in the world, and adult life expectancy was among the highest, even though medial services were limited. Eat more fruits and vegetables by having them as a snack, or adding them to other recipes. Also, consider adding sliced avocado to your sandwich instead of cheese, or forgoing the tomato sauce on your pizza. You can opt for egg whites or tofu rather than eggs, snack on olives or nuts instead of cookies. Eat lots of vegetables. Try a simple plate of sliced tomatoes drizzled with olive oil and crumbled feta cheese, or load your pizza with peppers and mushrooms instead of sausage and pepperoni. Salads, soups, and crudité platters are also great ways to load up on vegetables. Change the way you think about meat. If you eat meat, have smaller amounts and leaner cuts. Put small strips of chicken on your salad, or add diced prosciutto to a whole-wheat pasta dish. Always eat breakfast. Fruits, whole grains, and other fiber-rich foods are a great way to start your day, keeping you pleasantly full for hours. Eat seafood twice a week. Fish such as tuna, salmon, herring, and sardines are rich in Omega-3 fatty acids, and shellfish like mussels, oysters, and clams have similar benefits for brain and heart health. Cook a vegetarian meal one night a week. If it’s helpful, you can jump on the “Meatless Mondays” trend of foregoing meat on the first day of the week, or simply pick a day where you build meals around beans, whole grains, and vegetables. Once you get the hang of it, try two nights a week. Be sure not to load up on cheese, though. Use good fats. Extra-virgin olive oil, nuts, sunflower seeds, olives, and avocados are great sources of healthy fats for your daily meals. Some vegetable oils higher in polyunsaturated fats—like sunflower, safflower, soybean, and corn oil—are more heart-healthy than the mostly monounsaturated fats in olive oil. Enjoy some dairy products. Try small amounts of cheese, and eat Greek or plain yogurt. You want to make sure to choose low-fat or fat-free dairy products. For dessert, eat fresh fruit. Instead of ice cream or cake, opt for strawberries, fresh figs, grapes, or apples. Protecting against type 2 diabetes. 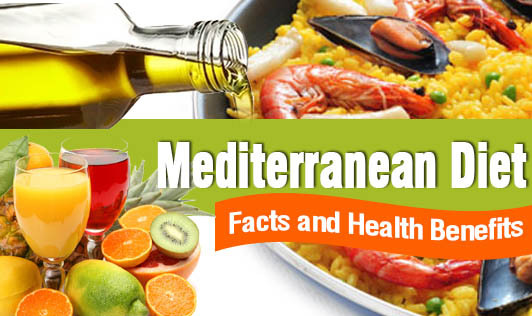 A Mediterranean diet is rich in fiber, slowing down digestion and preventing huge swings in blood sugar. Preventing heart disease and strokes. Refined breads, processed foods, and red meat are discouraged in a Mediterranean diet, and it encourages drinking red wine instead of hard liquor, which have all been linked to heart disease and stroke prevention. Keeping you agile. The nutrients gained with a Mediterranean diet may reduce a senior’s risk of developing muscle weakness and other signs of frailty by about 70 percent. Reducing risk of Alzheimer’s. Researchers speculate that the Mediterranean diet may improve cholesterol and blood sugar levels and overall blood vessel health—all factors that may reduce the risk of Alzheimer’s disease or dementia. Halving the risk of Parkinson’s disease. In a diet containing high levels of antioxidants that prevent cells from undergoing a damaging process called oxidative stress, the risk of Parkinson’s disease is practically cut in half. Increased longevity. When there is a reduction in developing heart disease or cancer, as in the case when you follow a Mediterranean diet, there is a 20% reduced risk of death at any age.